While the opposition to building new coal plants continues to grow, perhaps we should also add a lesser-known villain to the climate change culprit list: flat-screen TVs. Research is being conducted by Professor Michael Prather on a greenhouse gas called nitrogen trifluoride that’s used to make flat-screen televisions, The Guardian notes this week. And the gas could have a worse effect on global warming than some of the world’s largest coal plants. “…a potential greenhouse impact larger than that of the industrialised nations’ emissions of PFCs or SF6, or even that of the world’s largest coal-fired power plants” via The Guardian. Damn, I knew I had a good excuse for watching movies on my laptop. Prather estimates that production of the gas has grown to 4,000 tons per year and is expected to double by next year. While not much research has been done on nitrogen trifluoride, Prather says the problem with the gas is that it is 17,000 times more potent than carbon dioxide. That’s not the only thing wrong with some flat-screen TVs. The New York Times called the plasma TV the “SUV of the living room” last October because it chugs so much power. Well, the average flat-screen TV is pretty expensive, almost $1,000 — or as CNN puts it this morning, the extra money a household spent on higher gas prices in the past year. A few good excuses to forgo the purchase. Hello. Great job. This is a great post. Thanks! Scientists have researched that world is changing because our sun is changing, and it is all known that nobody can opposite this confrontation at once. Even if people not buying flat screen televisions. Unfortunately. 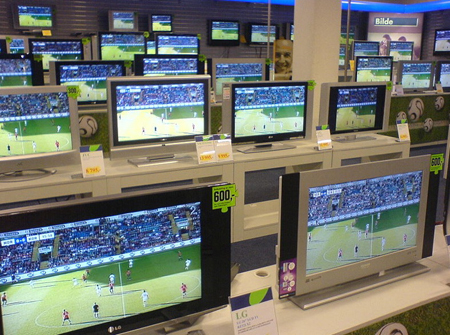 So, what TV can one buy these days? I’ve been searching for an energy star TV that’s not an LCD and it doesn’t look like anyone’s even making non LCD TVs much anymore. The author made no distinction between LCDs and Plasma–is this substance used for both types? Where in the process is the gas released? Production? TV manufacturing? Disposal? I’d venture a guess that front projectors are more environmentally sound than flat screens. You also get more bang for the buck with a front projector. Flat screens may chug a lot of power, but aren’t they a lot better than their CRT parents? Or because they’re generally bigger, do they use the same electricity? I’m still stuck into scientific practices. This is one article in one publication. It’s not a study based upon test data, it’s computational analysis drawn from other works – filtered through guesswork of the scholars who wrote the article. I’m especially an advocate of computational analysis. If I was the geek I am – starting out in search of a career, today – this is probably what I would do. But, the function is most often useful and productive when coupled with hard information drawn by traditional scientific methods from primary research. I will not be buying any Flat Screen TV’s because of your article. I had planned on buying at least three for my home—not anymore! I am taking this article to work because people are buying the flat screened televisions since they have come down in price. I will have this information submitted in the school district news bulletin at work. Thank you for the information. Could you do a comparison to the old televisions?